The drive starts in Winthrop, follows the Pateros and Entiat Lakes to Chelan and Wenatchee, the “Apple Capital of the World”. It is part of the Cascade Loop, and while we assume that you are coming from the North Cascades Highway, you may also reverse the drive and start from Wenatchee, such as from the Stevens Pass Greenway. Located in the beautiful Methow Valley, Winthrop is recreated as an old western town, with stylized wooden shop fronts, and boardwalks. Boasting more than 300 days of sunshine a year, the area is rich with year-round outdoor activities. Visit nearby Pearrygin Lake State Park (H5) which features a spring-fed lake and beach access. If you came from the North Cascades Highway during the summer, you will note that it is quite a bit drier here than it was through the mountains. Heading east on WA-20 for ten miles while following the Methow River, WA-20 will divide just after Twisp and you will need to turn right for WA-153. The WA-153 is a windy road with views of the hillsides and continues to follow the Methow River on its path to Pateros Lake. After thirty miles on WA-153 and just before US-97, consider turning left onto Alta Lake Road for a side trip to Alta Lake State Park (H9). A backdrop of mountains surrounds the lake, making this a beautiful spot for hiking, trout fishing, and camping. Back on WA-153, you will soon reach US-97. Turn right to continue heading south. The drive continues alongside Lake Pateros, revealing stunning, and uninterrupted views for several miles. In thirteen miles, US-97 Alt towards Chelan will be to your right. If you reach the Beebe Bridge, you’ve gone too far. But if you are looking for a faster way home or some adventures on the east side of Lake Entiat such as Daroga State Park (H6), this is also a beautiful route. Back on US-97 Alt, you are now in Chelan. The Chelan Ranger District (I1) is on your right just after the downtown area and in three miles from the ranger station, though US-97 Alt turns left heading through the Knapp Coulee, our drive continues on WA-971 (South Lakeshore Road) along the shore of Lake Chelan towards Lake Chelan State Park. Looking opposite the lake, you can see the Chelan Butte, and the Chelan Butte Wildlife Recreation Area (H3), popular with hang gliders. At 55 miles long, Lake Chelan is Washington’s largest natural lake and at 1,486 feet deep, it is the third deepest lake in the United States and twenty-fourth deepest in the world. 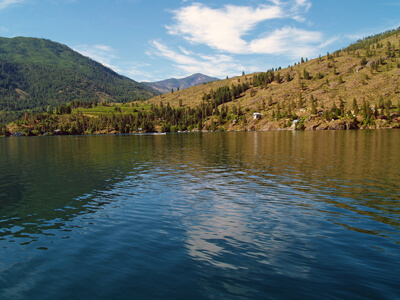 At Lake Chelan State Park (H2, enjoy glorious swimming amid mountain views, non-motorized boating, stand-up paddle board rentals, picnic area, playground, and camping. Just after Lake Chelan State Park, WA-971 turn left onto Navarre Coulee Road. If you were to continue straight, Twenty Five Mile Creek State Park (H10) is ten miles ahead on South Lakeshore Road. Its scenery is breathtaking. Navarre Coulee Road continues through a beautiful coulee with mountains and trees on either side and occasional views of Lake Entiat. After eight miles, the road rejoins US-97 Alt. Head south by turning right. The drive now continues alongside Lake Entiat, which was formed when the Rocky Reach Dam (A4) was built. The dam has a visitor center where you can learn about the area or view fish migrating through the dam’s fish ladder. Four miles after the dam, US-97 Alt will merge onto US-2. Since you are now in apple country, consider stopping at the Washington State Apple Commission Visitor Information (A5) right off the highway where you can have an apple, some apple juice and learn about the state’s largest agricultural industry. Our drive officially ends by following US-2 West into Wenatchee where you can enjoy the Wenatchee Confluence State Park (H7) and other attractions in Wenatchee. From here, you may head west on US-2 towards Blewett Pass and the Wenatchee Mountains or continue on the cascade loop by heading on west US-2 Stevens Pass Greenway, continuing onto Whidbey Island, and finally completing the loop with the North Cascades Highway. The entire loop is best enjoyed over a few days.